Emperor Theodosius I, who made Nicene Christianity the state church of the Roman Empire. Nicene Christianity became the state church of the Roman Empire with the Edict of Thessalonica in 380 CE, when Emperor Theodosius I made it the Empire's sole authorized religion. The Eastern Orthodox Church, Oriental Orthodoxy, and the Catholic Church each claim to be the historical continuation of this church in its original form, but do not identify with it in the caesaropapist form that it took later. Unlike Constantine I, who with the Edict of Milan of 313 CE had established tolerance for Christianity without placing it above other religions and whose involvement in matters of the Christian faith extended to convoking councils of bishops who were to determine doctrine and to presiding at their meetings, but not to determining doctrine himself, Theodosius established a single Christian doctrine (specified as that professed by Pope Damasus I of Rome and Pope Peter II of Alexandria) as the Empire's official religion. Earlier in the 4th century, following the Diocletianic Persecution of 303-313 and the Donatist controversy that arose in consequence, Constantine had convened councils of Christian bishops to define the orthodoxy, or "correct teaching", of the Christian faith, expanding on earlier Christian councils. A series of ecumenical councils met during the 4th and 5th centuries, but Christianity continued to suffer rifts and schisms surrounding the issues of Arianism, Nestorianism, and Miaphysitism. In the 5th century the Western Empire decayed as a polity: invaders sacked Rome in 410 and in 455, and Odoacer, an Arian barbarian warlord, forced Romulus Augustus, the last nominal Western Emperor, to abdicate in 476. However, apart from the aforementioned schisms, the church as an institution persisted in communion, if not without tension, between the east and west. In the 6th century the Byzantine armies of the Eastern Roman Emperor Justinian I recovered Italy and other sections of the western Mediterranean shore. The Eastern Roman Empire soon lost most of these gains, but it held Rome, as part of the Exarchate of Ravenna, until 751, a period known in church history as the Byzantine Papacy. 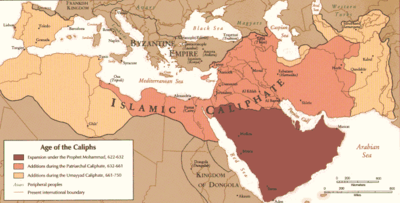 The Muslim conquests of the 7th century would begin a process of converting most of the then-Christian world in West Asia and North Africa to Islam, severely restricting the reach both of the Byzantine Empire and of its church. Missionary activity directed from Constantinople, the Byzantine capital, did not lead to a lasting expansion of the formal power of the Empire's state church, since areas outside the empire's political and military control set up their own distinct state churches, as in the case of Bulgaria in 919. Justinian I, who became emperor in Constantinople in 527, established the bishops of Rome, Constantinople, Alexandria, Antioch, and Jerusalem - referred to as the Pentarchy - as the leadership of the Imperial church and gave each bishop the title of "Patriarch". However, Justinian saw these bishops as under his tutelage: according to his arrangement, "the Emperor was the head of the Church in the sense that he had the right and duty of regulating by his laws the minutest details of worship and discipline, and also of dictating the theological opinions to be held in the Church". However, by Justinian's day, the churches that now form Oriental Orthodoxy had already seceded from the Imperial state church, while in the west Christianity was mostly subject to the laws and customs of nations that owed no allegiance to the Emperor in Constantinople. 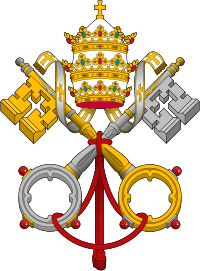 While eastern-born popes who were appointed or at least confirmed by the Eastern Emperor continued to be loyal to him as their political lord, they refused to accept his authority in religious matters, or the authority of such a council as the imperially convoked Council of Hieria of 754. Pope Gregory III (731-741) became the last Bishop of Rome to ask the Byzantine ruler to ratify his election. By then, the Roman Empire's state church as originally conceived had ceased to exist. In the East, only the largest fragment of the Christian church was under the Emperor's control, and with the crowning of Charlemagne on 25 December 800 AD as Imperator Romanorum by the latter's ally, Pope Leo III, the de facto political split between east and west became irrevocable. Spiritually, the Chalcedonian Church, as a communion broader than the imperial state church, continued to persist as a unified entity, at least in theory, until the Great Schism and its formal division with the mutual excommunication in 1054 of Rome and Constantinople. Where the Emperor's power remained, the state church developed in a caesaropapist form, although as the Byzantine Empire lost most of its territory to Islam, increasingly the members of the church lived outside the Byzantine state. The Eastern Roman Empire finally collapsed with the Fall of Constantinople to the Islamic Ottoman Turks in 1453. Western missionary activities created a communion of churches that extended beyond the empire, the beginnings of which predated the establishment of the state church. The obliteration of the Empire's boundaries by Germanic peoples and an outburst of missionary activity among these peoples, who had no direct links with the Eastern Roman Empire, and among Pictic and Celtic peoples who had never been part of the Roman Empire, fostered the idea of a universal church free from association with a particular state. On the contrary, "in the East Roman or Byzantine view, when the Roman Empire became Christian, the perfect world order willed by God had been achieved: one universal empire was sovereign, and coterminous with it was the one universal church"; and the state church came, by the time of the demise of the Byzantine Empire in 1453, to merge psychologically with it to the extent that its bishops had difficulty in thinking of Christianity without an emperor. Modern authors refer to this state church in a variety of ways: as the catholic church, the orthodox church, the imperial church, the imperial Roman church, or the Byzantine church, although some of these terms are also used for wider communions extending outside the Roman Empire. The legacy of the idea of a universal church polity carries on, directly or indirectly, in today's Catholic Church and Eastern Orthodox Church, as well as in others, such as the Anglican Communion. In 301, the Kingdom of Armenia, which Rome considered de jure a client kingdom though yielded de facto to the Parthians (its ruling dynasty was of Parthian extraction), became the first nation to adopt Christianity as its state church. 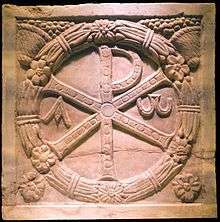 A church synod, or council, was held in Rome in 313, followed by another in Arles in 314, the latter presided over by Constantine while still a junior emperor (see Tetrarchy). These synods ruled that the Donatist faith was heresy and, when the Donatists refused to recant, Constantine launched the first campaign of persecution by Christians against Christians, and began imperial involvement in Christian theology. However, during the reign of Emperor Julian the Apostate, the Donatists, who formed the majority party in the Roman province of Africa for 30 years, were given official approval. Icon depicting Constantine and the bishops of the Council of Nicaea (325), with the Emperor holding the Creed of the First Council of Constantinople (381). The Emperor, considered to be a saint, is given more prominence than the bishops. Christian scholars and populace within the Empire were increasingly embroiled in debates regarding christology (i.e., regarding the nature of the Christ). Opinions ranged from belief that Jesus was entirely human to belief that he was entirely divine. The most persistent debate was that between the homoousian, or Athanasian, view (the Father and the Son are one and the same, eternal), which was adopted at the council meeting that Constantine called at Nicaea in 325, and the homoiousian, or Arian, view (the Father and the Son are similar, but the Father is greater than the Son). Emperors thereby became ever more involved with the increasingly divided Church. Constantine was of divided opinions (even as to being Christian), but he largely backed the Athanasian side, though he was baptized on his deathbed by the Arian bishop Eusebius of Nicomedia. His successor Constantius II supported a Semi-Arian position. Emperor Julian returned to the traditional (pagan) Roman/Greek religion, quickly quashed by his successor Jovian, a supporter of the Athanasian side. A Council of Rimini in 359 supported the Arian view. A Council of Constantinople in 360 supported a compromise (see Semi-Arianism). The Council of Constantinople in 381, called by Emperor Theodosius I reasserted the Nicene or Athanasian view and rejected the Arian view. 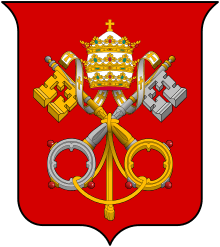 This council further refined the definition of orthodoxy, issuing, according to tradition, the Niceno-Constantinopolitan Creed. At the end of the 4th century the Roman Empire had effectively split into two states although their economies (and the Church, which only then became a state church) were still strongly tied. The two halves of the Empire had always had cultural differences, exemplified in particular by the widespread use of the Greek language in the Eastern Empire and its more limited use in the West (Greek, as well as Latin, was used in the West, but Latin was the spoken vernacular). By the time the state church of the Empire was established at the end of the 4th century, scholars in the West had largely abandoned Greek in favor of Latin. Even the Church in Rome, where Greek continued to be used in the liturgy longer than in the provinces, abandoned Greek. Jerome's Vulgate had begun to replace the older Latin translations of the Bible. The 5th century would see further fracturing of the state church of the Roman Empire. Emperor Theodosius II called two synods in Ephesus, one in 431 and one in 449, the first of which condemned the teachings of Patriarch of Constantinople Nestorius, while the second supported the teachings of Eutyches against Archbishop Flavian of Constantinople. Thus, in addition to losing all the western empire, the state church suffered a significant diminishment even in the east within a century of its setting up. Those who upheld the Council of Chalcedon became known in Syriac as Melkites, the imperial church, followers of the emperor (in Syriac, malka). This schism resulted in an independent communion of churches, including the Egyptian, Syrian, Ethiopian and Armenian churches, that is today known as Oriental Orthodoxy. In spite of these schisms, however, the imperial church still represented the majority of Christians within the by now already diminished Roman Empire. 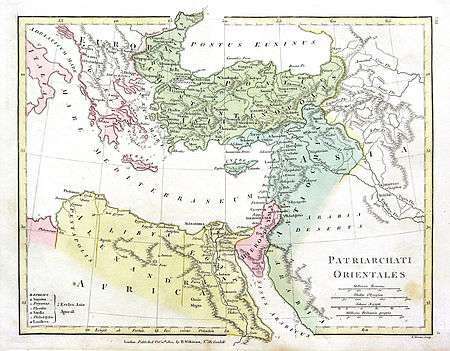 A map of the 5 patriarchates in the Eastern Mediterranean as constituted by Justinian I. Leo the Isaurian later transferred Greece, Illyria, Sicily and Calabria from Rome to Constantinople. Rome never recognized this pentarchy of five sees as constituting the leadership of the state church. It maintained that, in accordance with the First Council of Nicaea, only the three "Petrine" sees of Rome, Alexandria and Antioch had a real patriarchal function. The canons of the Quinisext Council of 692, which gave ecclesiastical sanction to Justinian's decree, were also never fully accepted by the Western Church. Muslim conquests of the territories of the patriarchates of Alexandria, Antioch and Jerusalem, most of whose Christians were in any case lost to the imperial state church since the aftermath of the Council of Chalcedon, left in effect only two patriarchates, those of Rome and Constantinople. Then in 740, Emperor Leo the Isaurian reacted to papal resistance to his iconoclast policy by transferring from the jurisdiction of Rome to that of Constantinople all but a minute portion of the then existing empire. Though the state church of the Roman Empire claimed religious authority over Christians in Egypt and the Levant, in reality the majority of Christians in these regions were by then miaphysites and members of other sects that had long been persecuted by Constantinople. The new Muslim rulers, in contrast, offered religious tolerance to Christians of all sects. Additionally subjects of the Muslim Empire could be accepted as Muslims simply by declaring a belief in a single deity and reverence for Muhammad (see shahada). As a result, the peoples of Egypt, Palestine and Syria largely accepted their new rulers and many declared themselves Muslims within a few generations. Muslim incursions later found success in parts of Europe, particularly Spain (see Al-Andalus). The spread of Christianity in Europe by 600 CE. This situation fostered the idea of a universal church linked to no one particular state and of which the state church of the Roman Empire was only part. Long before the Byzantine Empire came to an end, Poland also, Hungary and other central European peoples were part of a Church that in no way saw itself as the empire's state church and that, with the East-West Schism, had even ceased to be in communion with it. With the defeat and death in 751 of the last Exarch of Ravenna and the end of the Exarchate, Rome ceased to be part of the Byzantine Empire. Forced to seek protection elsewhere, the Popes turned to the Franks and, with the coronation of Charlemagne by Pope Leo III on 25 December 800, transferred their political allegiance to a rival Roman Emperor. More clearly than before, the church in the west, while remaining in communion with the state church of the Byzantine Empire, was not part of it. 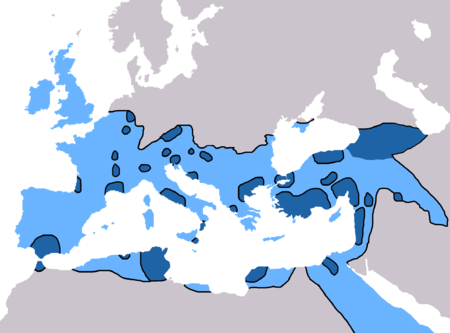 Disputes between the see of Rome, which claimed authority over all other sees, and that of Constantinople, which was now without rival in the empire, culminated perhaps inevitably in mutual excommunications in 1054. Even when persecuted by the emperor, the Eastern Church, George Pachymeres said, "counted the days until they should be rid not of their emperor (for they could no more live without an emperor than a body without a heart), but of their current misfortunes". The state church had come to merge psychologically in the minds of the Eastern bishops with the empire to such an extent that they had difficulty in thinking of Christianity without an emperor. ↑ Tony Honoré (1998), p. 5. 1 2 Schadé (2006), art. "Byzantine Church"
↑ In 1393, Patriarch Antony IV of Constantinople declared the Byzantine emperor to be "emperor (βασιλεύς) and autokrator of the Romans, that is of all Christians, and "it is not possible among Christians to have a Church and not to have an emperor. For the empire and the Church have great unity and commonality, and it is not possible to separate them" (Dimitri Obolensky, The Byzantine Inheritance of Eastern Europe (Variorum Reprints 1969 ISBN 978-0-86078102-8), p. 339). 1 2 Meyendorff 1996, pp. 89. 1 2 Wylen (1995). Pp 190-192. 1 2 Dunn (1999). Pp 33-34. 1 2 Boatwright (2004). Pg 426. ↑ Tertullian, Apologeticus 30.1, as discussed by Cecilia Ames, "Roman Religion in the Vision of Tertullian," in A Companion to Roman Religion (Blackwell, 2007), pp. 467–468 et passim. 1 2 3 Anderson (2010), p. 604. ↑ "The first Christians in Rome were chiefly people who came from the East and spoke Greek. The founding of Constantinople naturally drew such people thither rather than to Rome, and then Christianity at Rome began to spread among the Roman population, so that at last the bulk of the Christian population in Rome spoke Latin. Hence the change in the language of the liturgy. ... The liturgy was said (in Latin) first in one church and then in more, until the Greek liturgy was driven out, and the clergy ceased to know Greek. About 415 or 420 we find a Pope saying that he is unable to answer a letter from some Eastern bishops, because he has no one who could write Greek" (Alfred Plummer, Conversations with Dr. Döllinger 1870-1890, ed. Robrecht Boudens (Leuven University Press, 1985), p. 13). ↑ Cairns (1996), p. 124. "By 590 the church had not only been freed from persecution by the Roman state but had become closely linked with that state." ↑ George C. Michalopulos, "Canon 28 and Eastern Papalism: Cause or Effect?" ↑ Encyclopaedia Britannica "Quinisext Council"
↑ St Cletus Parish Adult Education, "Nails in the Coffin of Reunification"
↑ "It was the papacy also which kept alive in western Europe the ideal of a universal imperial Church, for the whole of western Christendom came to acknowledge the supremacy of the Roman see" Arthur Edward Romilly Boak, A History of Rome to 565 A.D., p. 4030. Amory, Patrick. 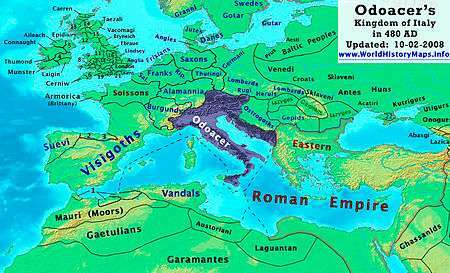 People and Identity in Ostrogothic Italy, 489–554. Cambridge, MA: Cambridge University Press. ISBN 978-0-521-52635-7. Anderson, Lara; et al. World and Its Peoples. Marshall Cavendish. ISBN 978-0-7614-7883-6. Bettenson, Henry Scowcroft, ed. (1967). Documents of the Christian Church (2nd ed.). London: Oxford University Press. Carroll, Warren H. (1987). The Building of Christendom. ISBN 0-931888-24-7. Dwyer, John C. (1998). Church History: Twenty Centuries of Catholic Christianity. Mahwah, NJ: Paulist Press. ISBN 0-8091-3830-1. Greer, Rowan A. The fear of freedom: a study of miracles in the Roman imperial church. Pennsylvania State University. ISBN 0-271-00648-X. Honoré, Tony (1998). Law in the Crisis of Empire 379-455 AD. Oxford University Press. Jedin, Hubert; Dolan, John (1980). The Imperial Church from Constantine to the Early Middle Ages. Payton, James R. Light from the Christian East: An Introduction to the Orthodox Tradition. Downers Grove, IL: Invervarsity Press. ISBN 978-0-8308-2594-3.